LANXESS will expand the production capacity of its butyl rubber plant in Zwijndrecht, Belgium, by 10 percent to meet growing global demand for regular butyl and halobutyl synthetic rubber. The company will invest EUR 20 million to increase capacity by an extra 14,000 metric tons per year. The current capacity of the plant is about 135,000 metric tons per year. Today, specialty chemicals group LANXESS opened Asia’s most state-of-the-art plant for ion exchange resins in India. The new plant was constructed over a period of two years in the chemical park in Jhagadia in the Indian state of Gujarat. It boasts an annual capacity of 35,000 metric tons. Around 200 employees from the Ion Exchange Resins (ION) business unit manufacture products for industrial water treatment for the semi-conductor and pharmaceutical industries, the food sector and the power industry. The opening marked the successful completion of the second expansion phase in Jhagadia. The first project phase, which was completed in March of this year, saw a rubber chemicals production plant taken into operation. Overall, LANXESS has invested around EUR 50 million in the site to date. With its high-quality Lewatit ion exchange resins, adsorbers and functional polymers, LANXESS has more than 70 years of experience and expertise as a one-stop supplier of premium products for water treatment. The high-tech resins produced there are used in the fields of water treatment in power generation, microelectronics, and the drinking water and food preparation industries. The broad range of applications for these small beads of resin includes, for example, the decalcification or desalination of water in dishwashers and the decarbonization or extraction of heavy metals from drinking water in water filters. In addition to Jhagadia, LANXESS also produces Lewatit ion exchange resins at sites in both Bitterfeld and Leverkusen. “India has become our second strongest growth market in Asia and we will therefore continue to drive forward expansion in this country in the next five years,” said Heitmann. According to forecasts, automobile manufacturing alone is set to rise by almost one-fifth in 2010 and by around seven percent in the years up to 2015. The electrical and electronics industries on the subcontinent are expected to expand by around 10 percent in the medium term. Overall growth of around eight percent is forecast for the Indian economy over the medium term. The next stage of expansion for Jhagadia is planned for 2012. From then on, high-tech plastics from the Semi-Crystalline Products business unit (SCP) will be produced at a capacity of 20,000 metric tons per year. “India is preparing to become the third biggest market for engineering plastics after the United States and China,” said Heitmann, adding: “It is therefore logical for LANXESS to support our fast-growing Indian customer base locally with high-caliber production.” Global automakers, their suppliers and numerous international producers of electrical and electronics goods are already active in India or are investing in new plants there. Many of these companies are already customers of SCP. The first construction phase for the new production site was completed in March 2010 with the start-up of rubber chemicals production. Since then, the plant has been supplying the fast-growing Indian tire and rubber industry. LANXESS is also supplying customers in the rubber, oil and lubricants industries worldwide with Vulkanox antioxidants from its Indian plant. This plant makes LANXESS the only Western company producing rubber chemicals in India. Once the new facilities for high-tech plastics production have been completed, LANXESS will have invested a total of around EUR 60 million in Jhagadia. Jhagadia is thus the second largest production site in India after Nagda in the Madhya Pradesh region. At Nagda, where LANXESS’s future competence center for chlorination and flavorings will be located, the Basic Chemicals business unit with its 300 or so employees produces specialty chemicals for the agrochemical industry, pharmaceutical and coating sectors and fragrance and flavoring industries. The Ion Exchange Resins and Rubber Chemicals business units are part of the Performance Chemicals segment, which generated sales of EUR 1,530 million in 2009. German specialty chemicals group LANXESS has taken another step on its expansion course in China. The company will invest about EUR 30 million in a plant for leather chemicals to be built in Changzhou, Jiangsu province江蘇省常州市, China. This is the single largest investment by the company’s Leather Chemicals business unit to date in China. Approximately 150 new jobs will be created through this investment. The facility, with an annual capacity of up to 50,000 metric tons, will be located at the Changzhou Yangtze Riverside Industrial Park. It is planned to go on stream by the first half of 2013 and will produce premium LANXESS leather chemicals for the local Chinese market such as Tanigan, Isoderm, Euderm and Levotan for various applications like leather tanning, dyeing and finishing. Since 1998, LANXESS has been operating a production site and research and development center in Wuxi 無錫, Jiangsu province. The site produces chemical products for leather processing and treatment, with an annual output of 30,000 metric tons. Leather chemicals are used to optimize the properties of the leather material such as its softness, water resistance, as well as ability to conceal minor defects and reduce soiling. The Leather business unit is part of LANXESS’ Performance Chemicals segment. It has approximately 1,100 people worldwide and production sites in Leverkusen (Germany), Filago (Italy), Rustenburg, Newcastle and Merebank (all South Africa), Zárate (Argentina), Wuxi (China) and Madurai (India). With a total area of 38 square kilometers, Changzhou New Port Area is located in the north part of Changzhou National Hi-Tech District and is about 10 kilometers away from down town. This area belongs to Alluvial Plain and the elevation is around 3-4.5 meters. Bordering the Yangtze River, Changzhou National Hi-Tech District boasts the golden coastal line of the Yangtze River. By now, along the 2.2-km-deepwater-front in the east, a general dock with a berth capacity of 30,000 tons has been completed; one container dock has been extended. One petrol-chemical dock and one tank zone are under construction. In the western part, docks with 1000-ton capacity will be built in the future. In order to speed up the development of the New Port Zone and Heavy Chemical Industry Park, complete infrastructure system has been built. The Water Plant is available, a Wasted Water Treatment Plant and a Cogeneration Power Plant are under plan. The New Port Zone has attracted many international and domestic investors. LANXESS and Dutch company Royal DSM N.V. have reached an agreement in principle involving the sale of DSM Elastomers to LANXESS for EUR 310 million on a cash and debt-free basis. DSM Elastomers produces the synthetic rubber ethylene propylene diene monomer (EPDM) under the brand name Keltan. The price for the DSM Elastomers business represents an EBITDA multiple of roughly 6 based on the expected EBITDA of 2010. The acquisition will be financed by LANXESS out of existing liquidity and is expected to be EPS accretive as of 2011. The transaction contracts will be finalized once a consultation process with the employees' representatives of DSM in the Netherlands has been completed. The transaction is subject to approval from antitrust authorities. Closing is expected in the first months of 2011. Sittard-Geleen-based DSM Elastomers has approximately 420 employees worldwide and is expected to achieve sales of about EUR 380 million in 2010. DSM operates an EPDM plant in Sittard-Geleen, the Netherlands, with an annual production capacity of 160,000 metric tons. DSM’s other EPDM plant is based in Triunfo, Brazil, with an annual capacity of 40,000 metric tons. LANXESS plans to base the headquarters of the combined EPDM businesses in Sittard-Geleen. LANXESS’ Technical Rubber Products business unit (TRP), headed by Guenther Weymans, sells EPDM under the brand name Buna EP. LANXESS produces EPDM in Marl, Germany, and Orange, United States, with a combined annual capacity of 120,000 metric tons. The global rubber market for EPDM is expected to show single-digit percentage growth per annum in the next ten years, driven by rising demand in China and Brazil. Through the transaction, LANXESS plans to strengthen its technology base by gaining access to the ACE technology. DSM is in the process of implementing this technology on a larger scale at its site in Sittard-Geleen. In comparison to conventional technology, ACE reduces the energy and production costs for EPDM and at the same time broadens the application possibilities of the rubber. LANXESS will evaluate implementing ACE technology into its existing plants. DSM Elastomers, a business group of Royal DSM N.V., today announced that in 2008 it will start producing specialty EP(D)M’s based on a worldwide exclusive license agreement with NOVA Chemicals. The agreement further underlines DSM’s innovation ambitions in its Performance Materials cluster, which is an important element of DSM’s strategy Vision 2010 - Building on Strengths. Based on NOVA Chemicals’ proprietary single site catalyst technology, DSM Elastomers has achieved key breakthroughs in the area of advanced catalysis technology that allow for the efficient production of EP(D)M’s with improved properties. This new technology will be branded Keltan ACE™. ACE is the acronym for Advanced Catalysis Elastomers. “Our customers will benefit from a wider range of premium EPDM products,” said Werner Breuers, LANXESS Board Member. EPDM is used above all in the automobile industry but also in the plastics modification, cable and wire, construction and oil additives industries. Its properties include very low density, good resistance to heat, oxidation, chemicals and weathering as well as good electrical insulation properties. Additional products in TRP’s portfolio include Polychloroprene rubber (CR), Hydrogenated nitrile rubber (HNBR), Ethylene vinyl acetate rubbers (EVM) and Nitrile Rubber (NBR). TRP is part of LANXESS’ Performance Polymers segment, which recorded sales of EUR 2.4 billion in 2009. Apart from Marl and Orange, the business unit has production sites in Leverkusen, Dormagen (both Germany) and La Wantzenau (France). The business unit has roughly 1,000 employees. With the beginning of February 2011, the specialty chemicals group LANXESS has produced the five millionth metric ton of its plastics precursor caprolactam at its facility in Antwerp, Belgium. This is the equivalent of roughly 250,000 tankers full. The world-scale facility in the port of Antwerp commenced production in 1967. An investment project totalling Euro 35 million is underway to expand production there by ten percent from its current volume of 200,000 metric tons per year. LANXESS has about 1,400 employees at its site in Antwerp. Caprolactam is required primarily for the production of the plastic polyamide 6 and used for the production of high-tech Durethan plastics. Durethan is most commonly used in the automotive industry. The use of the material instead of sheet steel enables above all considerable reductions in component weight, particularly in plastic-metal composite technology (hybrid technology), resulting in lighter and safer vehicles that consume less fuel. Global demand for high-tech plastics continues to rise, particularly in the U.S.A., China and India. Experts expect the global use of high-tech plastics per automobile to increase by roughly seven percent per year through 2020. LANXESS is strengthening its commitment to produce premium synthetic rubber from biobased raw materials. As part of this commitment, LANXESS has increased its minority shareholding in Gevo, Inc. that focuses on renewable chemicals and advanced biofuels. LANXESS’ shareholding now amounts to 9.1 percent after the world’s largest synthetic rubber producer invested USD 17 million in the US-company’s initial public offering. LANXESS initially invested USD 10 million in Gevo as part of a private placement in May 2010. LANXESS’ increased equity stake reflects the good progress made by both companies in developing isobutene from renewable resources. Isobutene is a key raw material needed in the manufacture of butyl rubber. Isobutene is conventionally produced in steam crackers, which use various petrochemical-based materials as feedstock. Alternatively, Gevo is developing a fermentation process to produce the organic compound isobutanol from the fermentable sugars発酵性糖 in biomass, starting with corn. At the same time, LANXESS is developing a dehydration process to convert isobutanol into isobutene. In addition to the share deal, both companies have signed an agreement that gives LANXESS certain exclusive rights to purchase biobased isobutanol from Gevo, while Gevo receives an exclusive first right to supply LANXESS with specified quantities of biobased isobutanol over a ten-year period. This arrangement is still subject to the parties’ completion of a definitive off-take agreement, which is presently in negotiation. Gevo’s isobutanol can be used directly as a specialty chemical, as a gasoline blendstock, a jet feedstock and through conversion into plastics, fibers, rubber and other polymers. Gevo is currently retrofitting capacity of 22 million gallons per year (MGPY) at its first ethanol facility in Luverne, Minnesota, to produce 18 MGPY (50,000 metric tons) of isobutanol in the first half of 2012. In addition, Gevo plans to expand its production capacity in the coming years through acquisitions and joint ventures and aims to have more than 350 MGPY of production capacity by 2015. LANXESS’ dehydration process has not only proven to be successful in the laboratory but also in a small-scale reactor in Leverkusen, Germany, over a period of several months. Tests have shown that the process can deliver biobased butyl rubber that meets the rigorous specifications of the tire industry, which represents roughly 25 percent of LANXESS’ sales. Colorado-based Gevo was founded in 2005 and currently has about 100 employees. It has raised USD 95.7 million through its initial public offering and its stock started trading on the Nasdaq stock exchange on February 9, 2011. Other existing shareholders in Gevo, including Richard Branson’s Virgin Green Fund, have also invested additional funds in the IPO. LANXESS is the world’s second-largest producer of butyl rubber and has plants in Sarnia, Canada, and Zwijndrecht, Belgium. The company is also investing EUR 400 million in a new butyl rubber plant in Singapore, which comes on stream in the first quarter of 2013. LANXESS’ butyl rubber business, headed by Ron Commander, produces high-quality butyl and halobutyl rubbers for the tire and rubber industry. High impermeability to gases and liquids is one of the great advantages of these rubbers. This property is particularly useful for tire inner liners, inner tubes and other niche markets, such as pharmaceutical closures and protective clothing. ICM, Inc(a leader in the ethanol industry). : Since 1995, ICM has focused on sustaining agriculture through innovation by engineering, building, and supporting the renewable fuel industry’s leading biorefineries and has designed approximately 60% of all current North American ethanol production capacity. Through Gevo’s exclusive alliance with ICM, we have successfully demonstrated the production of isobutanol via the retrofit of a one MGPY ethanol demonstration facility in St. Joseph, Missouri using our first-generation bacterial biocatalyst. We plan to work with ICM to deploy our technology platform through retrofit of these production facilities in North America. Cargill: Cargill is an international producer and marketer of food, agricultural, financial and industrial products and services. Cargill has granted Gevo exclusive rights to integrate Cargill’s world class microorganisms into its GIFT™ process for the production of butanols from cellulosic sugars that are derived from biomass such as corn stover, switchgrass, forest residues and other sustainable feedstocks. CDTECH: Gevo has secured a non-binding development and marketing commitment from CDTECH, a leading hydrocarbon technology provider for the petrochemical and refining industry. Gevo believes that its relationship with CDTECH will accelerate the development of a broader market for downstream applications of its isobutanol. Synthetic Rubber: Gevo has signed a non-binding heads of agreement to supply LANXESS, with isobutanol for the production of butyl rubber. Gasoline Blendstock: Total has signed a non-binding letter of intent to purchase isobutanol for use as a second-generation biofuel. Materials, Plastics and Fibers: Toray has signed a non-binding letter of interest related to the future supply of isobutanol for the production of para-xylene for the production of plastics and other performance materials. Biojet Gevo is working closely with the Air Transport Association of America, the U.S. Department of Defense, the U.S. Air Force and other companies in a strategic effort to develop the biojet industry. A non-binding letter of intent has been signed with United Air Lines to supply their hub airport in Chicago at O’Hare International Airport starting in 2013. LANXESS has agreed to acquire the Material Protection business of Switzerland’s Syngenta. ・LANXESS strengthens focus on megatrend urbanization. As a result, the German specialty chemicals company will become one of the leading suppliers of biocides for construction materials. The transaction is expected to close in April 2011. Both parties have agreed not to disclose the acquisition price. LANXESS will gain access to a broad range of fungicidal and insecticidal active ingredients as well as application technologies used to protect construction materials such as wood, wallboards and coatings from being discolored and damaged. Syngenta’s Material Protection business had sales of around EUR 19 million in 2010. Some 90 percent of sales is generated in Europe and North America. LANXESS will acquire the intellectual property, customer lists, supply contracts and registrations for the Syngenta products. Employees and fixed assets are not part of the transaction. The transaction will be financed from existing liquidity. The acquisition is also the starting point for a long-term strategic partnership between both companies. LANXESS will gain access to active ingredients and technologies developed by Syngenta in the future, for use in material protection. The Material Protection Products (MPP) business not only offers products for the preservation of construction materials but also active ingredients for disinfectants and stabilizers for non-alcoholic beverages and wine. MPP has production sites in Krefeld-Uerdingen and Dormagen (Germany), Wuxi (China) as well as Madurai (India). The business, headed by Torsten Derr, has annual sales of less than EUR 200 million. In 2010, LANXESS’ fine chemicals division Saltigo agreed on a long-term cooperation with Syngenta - one of the world’s leading agrochemical companies. The Basel-based company is investing some EUR 50 million in expanding several Saltigo facilities in Leverkusen to significantly enhance its capacity for synthesizing active ingredients for crop protection agents. Saltigo produces the active ingredients and intermediates at these facilities exclusively for Syngenta and is one of the Swiss company’s strategic partners throughout the world. LANXESS (lanxess.com) is a leading specialty chemicals company with sales of EUR 5.06 billion in 2009 and currently around 14,700 employees in 24 countries. The company is represented at 45 production sites worldwide. The core business of LANXESS is the development, manufacturing and marketing of plastics, rubber, intermediates and specialty chemicals. LANXESS has selected Singapore as the site for its new neodymium polybutadiene rubber (Nd-PBR) plant. The German specialty chemicals company plans to invest roughly EUR 200 million in a 140,000 metric tons per annum facility on Jurong Island Chemical Park. The facility will be the largest of its kind in the world. About 100 jobs will be created. The plant is expected to start up in the first half of 2015. A corresponding memorandum of understanding (MoU) will be signed tomorrow, June 2, 2011, between LANXESS CEO Axel C. Heitmann and Leo Yip, Chairman of the Singapore Economic Development Board (EDB). The signing is in connection with the first-ever official visit of German Chancellor Angela Merkel to Singapore. LANXESS conducted a feasibility study to evaluate potential locations for the plant in Asia. Singapore won due to a very good raw materials supply. LANXESS and the Petrochemical Corporation of Singapore (Private) Limited (PCS) have signed a MoU on the long-term supply, via pipeline, of butadiene from PCS to LANXESS and raffinate II from LANXESS to PCS. Butadiene is the raw material LANXESS needs to produce Nd-PBR and raffinate II will be a product stream from LANXESS’ future butyl rubber plant in Singapore. “We are delighted to have reached this MoU with LANXESS to supply the key feedstock for its state-of-the-art synthetic rubber plant and to purchase raffinate II from them,” said PCS Managing Director, Akira Yonemura. Other arguments in favor of Singapore were its excellent infrastructure, highly-skilled workforce, large sea port and close proximity to growth markets. "We are delighted with LANXESS’ intention to build its new Nd-PBR plant in Singapore," said Leo Yip, Chairman of the Singapore Economic Development Board. "LANXESS’ expansion plan is a testament to Singapore’s value as a strategic location for high value manufacturing activities." LANXESS’ new Nd-PBR plant will be located on Jurong Island next to the company’s EUR 400 million butyl rubber plant, which is currently under construction and will come on stream in the first quarter of 2013. Construction of the butyl rubber plant is progressing according to schedule. Engineering and soil preparation have been completed and the installation of infrastructure and steel is underway. In addition, LANXESS reached one million man hours without lost time incident this month on the building site, at which 750 employees are currently active. LANXESS is the leader in synthetic rubber for high-performance ‘green tires’ - the fastest growing sector in the tire industry, with an annual global growth rate of about nine percent. Growth is even more pronounced in Asia at 14 percent per year. The world’s leading tire manufacturers, who are supplied by LANXESS, are responding to this demand by expanding production in Asia. Demand is being driven by the megatrend mobility as well as motorists calling for higher environmental and safety standards in performance tires. In addition, demand is being accelerated by European Union legislation. As of 2012, all new tires sold in Europe have to be labeled for fuel efficiency, wet grip and external rolling noise. Japanese tire manufacturers voluntarily introduced tire labeling at the start of 2010 and the topic is under discussion in South Korea. Nd-PBR is part of a tire’s compound and reduces energy consumption more efficiently than many other tire rubbers. It also reduces tire abrasion thus playing a significant role in making cars safer as well as more ecological and economical. Nd-PBR was invented by LANXESS in Germany - the heart of company’s research and development activities. The largest R&D centers are in Leverkusen, Krefeld-Uerdingen and Dormagen, Germany. LANXESS increased its R&D expenditures by 15 percent in 2010 and plans to increase it by another 15 percent to roughly EUR 130 million in the current year. Some 80 percent of this amount will focus solely on Germany. Currently, over 400 employees are active for LANXESS in R&D in Germany. NKNK(Nizhnekamskneftekhim) is one of the biggest producers and exporters of petrochemical products in the Russian Federation. Sythos S.A. is one of the largest manufacturers of chemical raw materials in Poland, as well as being Europe’s No. 1 manufacturer of rubber emulsions and third largest manufacturer of polystyrene for foaming applications. Synthos S.A. was established on the basis of Firma Chemiczna Dwory S.A. and Kaucuk a.s.
“Our domestic sites form the basis of our innovative capability, the basis of our technological expertise and therefore the basis of our competitiveness. Germany holds the key to making our products more efficient and even better in the future,” said Heitmann. Nd-PBR belongs to LANXESS’ Performance Butadiene Rubbers (PBR) business unit, headed by Joachim Grub. The highly innovative rubber is currently produced in Dormagen, Germany, Cabo, Brazil, Port Jérôme, France, and Orange, Texas, USA. Apart from tires, performance butadiene rubbers are used for the modification of plastics in the manufacture of High-Impact Polystyrene (HIPS) for injection molding applications. Other areas of application include golf balls, running shoes and conveyor belts. PBR is part of LANXESS’ Performance Polymers segment, which achieved total sales of EUR 3.8 billion in 2010. LANXESS is a leading specialty chemicals company with sales of EUR 7.1 billion in 2010 and currently around 15,500 employees in 30 countries. The company is at present represented at 46 production sites worldwide. The core business of LANXESS is the development, manufacturing and marketing of plastics, rubber, intermediates and specialty chemicals. LANXESS will break ground for its new neodymium polybutadiene rubber (Nd-PBR) plant in Singapore on September 11 this year. The German specialty chemicals company plans to invest roughly EUR 200 million (about SGD 340 million) in a 140,000 metric tons per annum facility in Jurong Island Chemical Park. The facility will be the largest of its kind in the world and serve the growing market for “Green Tires”, especially in Asia. About 100 jobs will be created. The plant is expected to start up in the first half of 2015. Engineering work has advanced considerably since June 2011, when the company announced it had selected Singapore as the site for the new plant. “I am delighted to announce that it is now full steam ahead for the second largest investment project in our company’s history,” said LANXESS’ Chairman of the Board of Management, Axel C. Heitmann, at an event in Singapore to sign contracts with key suppliers. At today’s event, Heitmann announced that LANXESS has signed contracts with key suppliers to its Nd-PBR plant. With these suppliers in place, the project execution phase can now start to set up the infrastructure for the construction of the plant. Petrochemical Corporation of Singapore (Private) Limited (PCS) has agreed on a long-term supply of butadiene to LANXESS. Butadiene is the raw material LANXESS needs to produce Nd-PBR. PCS is building a new butadiene extraction unit and associated infrastructure necessary to supply the raw material. Both companies had signed a Memorandum of Understanding already in June last year regarding the supply. In addition, Singapore’s TP Utilities Pte Ltd (a wholly-owned unit of Tuas Power Ltd) will provide steam to the Nd-PBR plant. TP Utilities is adding 650 tons per hour of steam capacity to its existing biomass-clean coal cogeneration plant on Jurong Island, which currently has 500 tons per hour of steam capacity and 100 Megawatt of electricity generation capacity. LANXESS had conducted a feasibility study to evaluate potential locations for the plant in Asia. Singapore won due to a very good raw materials supply, its excellent infrastructure, highly-skilled workforce, large sea port and close proximity to key customers in the booming Asia region. LANXESS is the market leader for Nd-PBR used in “Green Tires” - the fastest growing sector in the tire industry, with an annual global growth rate of about 10 percent. Growth is even more pronounced in Asia at 14 percent per year. Demand is being driven by the megatrend mobility, above all in the regions of Asia and Latin America, as the middle class there becomes more affluent. In addition, demand will be accelerated by tire labeling being introduced around the world. November 2012 will see the launch of mandatory tire labeling in the European Union. Tires will be graded from A to G according to their fuel efficiency and wet grip. Rolling noise is also measured. Therefore, the new legislation provides more transparency for consumers by highlighting the added value of “Green Tires”. Japan and South Korea were the first countries in the world to introduce a label system. After a voluntary tire label was introduced in Japan in January 2010, South Korea launched its voluntary labeling in November 2011 and will introduce a mandatory label at the end of 2012. Other countries like Brazil, the USA and China are expected to follow in the coming years. Last year, LANXESS commissioned a study with Frost & Sullivan consultants to examine the environmental awareness of drivers in Singapore in relation to their automobiles. The study revealed that motorists were concerned about the environment and were already undertaking measures at home to reduce pollution. However, their environmental concerns did not fully extend to their car and tires, due to lack of information available about the positive impact through tire labeling. According to the study, the use of “Green Tires” could result in a saving of more than 352,600 tons of CO2 as well as a saving of more than 140 million liters of fuel annually in Singapore. Nd-PBR is used in the treads and sidewalls of “Green Tires”. It helps reduce the rolling resistance and increase the fuel efficiency of a tire. Nd-PBR is highly resistant to abrasion and plays a significant role in making tires more durable and safer. Nd-PBR belongs to LANXESS’ Performance Butadiene Rubbers (PBR) business unit, headed by Joachim Grub. The highly innovative rubber is currently produced in Dormagen, Germany; Cabo, Brazil; Port Jérôme, France and Orange, Texas, USA. Apart from tires, performance butadiene rubbers are used for the modification of plastics in the manufacture of High-Impact Polystyrene (HIPS) for injection molding applications. Other applications include golf balls, running shoes and conveyor belts. PBR is part of LANXESS’ Performance Polymers segment, which achieved total sales of EUR 3.8 billion (about SGD 6.4 billion) in 2010. LANXESS’ new Nd-PBR plant will be located on Jurong Island next to the company’s butyl rubber plant, which represents the company’s single-largest investment at EUR 400 million (about SGD 675 million). It is currently under construction and will come on stream in the first quarter of 2013. Construction of the butyl rubber plant is progressing according to schedule. The installation of infrastructure and steel has been successfully completed. Most of the equipment is on site and installed. More than 2,000 workers are currently employed on the construction site. LANXESS is a leading specialty chemicals company with sales of EUR 7.1 billion in 2010 and currently around 16,100 employees in 30 countries. The company is at present represented at 47 production sites worldwide. The core business of LANXESS is the development, manufacturing and marketing of plastics, rubber, intermediates and specialty chemicals. LANXESS is a member of the leading sustainable indices Dow Jones Sustainability Index (DJSI) World and FTSE4Good. Lanxess is in talks to buy Belgian chemicals group Taminco NV from private equity firm CVC Capital Partners for about EUR 1 billion or $1.4 billion, the Financial Times Deutschland reported. German rubber chemicals group Lanxess has walked away from talks to buy Belgium's Taminco as it could not agree with seller CVC over the price, Financial Times Deutschland reported, citing sources. Lanxess has bid about 1 billion euros ($1.43 billion) for the chemicals maker, which would have made the deal the biggest takeover in Lanxess's six-year history, the paper said. Buyout firm CVC would now revive plans to take Taminco public if it does not find another prospective buyer, the paper added. The acquisition would reportedly be the largest in Lanxess’ history. Taminco, which produces alkylamines and alkylamine derivatives, reported sales of EUR 715 million and profit of EUR 41 million in 2010. Taminco has eight production plants worldwide dedicated to the production of alkylamines and alkylamine derivatives, comprising two large facilities each in Europe and the United States, and smaller facilities in China and Brazil. The company employs 800 people in 16 countries worldwide. Taminco, which was spun off in 2003 from the chemical and pharmaceutical company UCB, was acquired by CVC Capital Partners in 2007 for an enterprise value of EUR 800 million. First-quarter net income at Lanxess jumped to 166 million euros from 104 million euros a year earlier. The chemical maker is rated Baa2 at Moody’s Investors Service and an equivalent BBB by Standard & Poor’s. In Europe, Taminco’s main competitor is BASF SE. Taminco was spun off from UCB SA in 2003. The company is active in Asian markets, which makes it attractive to makers of intermediate chemicals in the region as they seek to add domestic production. Taminco has reduced debt to 3.2 times earnings before interest, taxes, depreciation and amortization, a ratio implying borrowings of about 510 million euros. Ebitda rose 14 percent to 159 million euros last year. A purchase of Taminco would add to a flurry of deals in the chemicals industry, as demand rebounds from customers in the manufacturing, automobile and personal-care industries. BASF last year purchased Cognis GmbH for $4.3 billion, followed by Berkshire Hathaway Inc.’s acquisition of Lubrizol Corp. for $9 billion three months later. Solvay SA, the world’s biggest soda-ash maker, announced the acquisition of Rhodia SA last month, and Ashland Inc., the maker of Valvoline motor oil, agreed today to buy closely held International Specialty Products Inc. for $3.2 billion in cash. Laxness completed its acquisition of DSM’s elastomer business for $415 million in March, adding technology to lower production costs of the material used in cars, cables and construction. The German chemicals maker also bought Brazilian rubber maker Petroflex Industria & Comercio SA in 2008 to boost its presence in South American markets. LANXESS is investing EUR 15 million in its glass fiber plant in the Antwerp docklands. For the specialty chemicals company glass fibers are a key intermediate for the production of high-tech plastics. With the expansion, the actual annual capacity of 60,000 metric tons will increase by 10 percent. The announcement was made during a LANXESS High-Tech Plastics Day at the facilities for caprolactam and glass fibers in Belgium. With the investment the glass fiber plant will replace both furnaces. “The high-tech plastics business is a major growth driver for LANXESS. There is attractive business potential in the global market arising from the increasing demand for modern mobility as well as from the electric and electronic markets,” stated Werner Breuers, member of the Board of Management of LANXESS AG. The global demand for high-tech plastics is expected to increase by roughly seven percent per year through 2020. Just before summer an investment project of EUR 35 million to expand the production of the plastic intermediate caprolactam at the site in the Antwerp docklands was finalized. The production capacity of 200,000 metric tons per year will be increased by another 10 percent. Since breaking away from Bayer in 2004, Lanxess has increased caprolactam (CPL) capacity to 220,000 tonnes per year from 50,000 tonnes per year. The company repaired its glass furnaces in 2010 – and will do again in 2013 – to increase annual capacity by 10% to 66,000 tonnes. One third of the caprolactam and glass fibre products are sold to external customers and the other two-thirds are used by Lanxess itself in its PA and PBT SCP compounds. LANXESS has been investing substantial amounts in the expansion of its global production network for high-tech plastics during the last 18 months. Including the glass fibers expansion, recent investments for high-tech plastics account for EUR 90 million. LANXESS’ Semi-Crystalline Products (SCP) business unit is a leading supplier of premium high-tech plastics. New compounding facilities are being built in the United States and Asia. In the existing compounding plants investments are being made to increase capacity. LANXESS has declared 2011 the Year of High-Tech Plastics. As part of the theme year, LANXESS is initiating a series of events and taking part in trade fairs and exhibitions that provide information to all interest groups. The company highlights where high-tech plastics are used, the benefits they offer and, in particular, how they can also help ensure sustainable development. The High-Tech Plastics Day for the European media in Antwerp is part of this program. The Semi-Crystalline Products business unit belongs to the Performance Polymers segment. It employs around 1,500 people worldwide with current production sites in Belgium (Lillo and Kallo in the Antwerp harbor), Germany (Krefeld-Uerdingen and Hamm-Uentrop (JV)), and China (Wuxi). In Wuxi, Lanxess has added a third line to increase compounding capacity to 60,000 tonnes per year, up from 20,000 tonnes per year in 2005. Outside Europe, Lanxess is investing €10m each in new plants in North Carolina, the US, and Gujarat, India. Each of these new two plants will have 20,000 tonnes per year compounding capacity when they come on stream in 2012 and will draw upon polyamide 6 polymerised at the Krefeld-Uerdingen plant in Germany from caprolactam made by Lanxess in Antwerp. The automotive industry is the largest customer for the Semi-Crystalline Products (SCP) business unit, which produces Durethan(PA6/PA66) and Pocan(PBT). These highly innovative products allow for the design of lighter-weight plastic parts to replace metal parts in automobiles, contributing to fuel efficiency and reduced emissions. In addition, Durethan and Pocan enable carmakers and car parts suppliers to achieve considerable savings through cheaper production and easier assembly. LANXESS is a leading specialty chemicals company with sales of EUR 7.1 billion in 2010 and currently around 15,800 employees in 30 countries. The company is at present represented at 46 production sites worldwide. The core business of LANXESS is the development, manufacturing and marketing of plastics, rubber, intermediates and specialty chemicals. 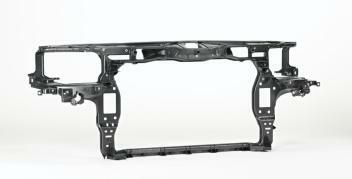 One recent automotive innovation was frontends, made from a glass fibre reinforced PA6 and metal hybrid, which are 40% lighter than conventional all-steel frontends. Hartwig Meier, head of SCP product and application development, said there are now 60 million hybrid frontends on more than 70 car models, including the new 2011 Mercedes Benz A- and B-Class cars. The company has also developed an all-plastic frontend for the new Audi A8 car, comprising formed polyamide composite inserts made from continuous fibre reinforced “organic sheet”. Previously, steel or aluminum sheet was used as the metal component for hybrid technology. The plastic-metal composite technology invented by LANXESS, also known as hybrid technology, has become firmly established in the automotive industry for the manufacture of lightweight, high-strength structural parts such as front ends, pedal support brackets and brake pedals. Previously, steel or aluminum sheet was used as the metal component. Now, for the first time, an organic plastic sheet has been used alongside aluminum sheet in a hybrid front end: for the lower beam of the front end of the new Audi A8, where a U-shaped profile made of the lightweight material is used. "This front end proves that organic sheet meets all the requirements relating for instance to torsional and flexural strength. It is an excellent alternative to steel and aluminum sheet in hybrid technology. We regard the component as an intermediate step to all-plastic hybrid front ends that are manufactured on the production line using only inserts of organic sheet in combination with polyamide 6," said Ulrich Dajek, a design expert at LANXESS. LANXESS is strengthening its commitment to produce premium synthetic rubbers from bio-based raw materials. The German specialty chemicals company aims to commercially produce ethylene-propylene-diene monomer (EPDM) from bio-based ethylene by the end of the year. It will be the first form of bio-based EPDM rubber in the world. EPDM is conventionally produced using the petroleum-based raw materials ethylene and propylene. Alternatively, LANXESS plans to use ethylene derived purely from the renewable resource sugar cane. This bio-based form of ethylene is produced by dehydrating ethanol from Brazilian sugar cane. The company Braskem S.A. will supply the bio-based ethylene via pipeline to LANXESS’ existing EPDM plant in Triunfo, Brazil. “LANXESS will contribute to broaden our portfolio of renewable chemicals’ clients. This agreement will bring the benefits of green ethylene to other important applications and markets. LANXESS has extensive automotive experience and an excellent reputation in this market, which makes it an ideal partner,” said Marcelo Nunes, Braskem’s Renewable Chemicals Director. Triunfo currently produces 40,000 metric tons per year of regular EPDM rubber and it is expected that the first batches of the product Keltan Eco will amount to several hundred metric tons. The company’s other EPDM production sites are based in Geleen, The Netherlands, Marl, Germany, and Orange, Texas, U.S. All EPDM grades will be sold in the future under the brand name Keltan. EPDM is used above all in the automotive industry but also in the plastics modification, cable and wire, construction and oil additives industries. Its properties include very low density, good resistance to heat, oxidation, chemicals and weathering as well as good electrical insulation properties. LANXESS will be showcasing Keltan Eco at its Rubber Day Germany, being held in Dusseldorf today, for the first time. In addition, LANXESS is already seeking alternative sources to produce the premium synthetic rubber product butyl rubber, which is used predominantly in the tire industry. Together with Colorado-based Gevo, Inc, LANXESS is developing isobutene from renewable resources starting with corn. Isobutene is a key raw material needed in the manufacture of butyl rubber. Last year, LANXESS started up a new on-site power plant at its Brazilian site in Porto Feliz, which produces iron oxide pigments. The innovative, highly efficient cogeneration plant for the production of electricity and steam is powered by bagasse, a fibrous component of sugar cane that is left over after sugar production. Thanks to the use of this renewable, environmentally friendly raw material, energy can be produced on a CO2-neutral basis for the site. LANXESS is investing EUR 12 million to convert 50 percent of its ethylene propylene diene monomer (EPDM) synthetic rubber production in Geleen, the Netherlands, to innovative Keltan ACE technology. During 2013, the German specialty chemicals company will implement the new technology at the largest of its three production lines, which accounts for half of the total production capacity of 160,000 metric tons per year in Geleen. • Base catalyst technology licensed from Nova Chemicals. • DSM developed a catalyst family for the production of Keltan and holds strong patent positions. • Green technology. No catalyst waste and reduced energy consumption. with state-of-the-art Ziegler-Natta or classical metallocene chemistry. dedicated to peroxide curing of EPDM. First new product is Keltan DE 8270C. Compared with conventional production processes, Keltan ACE technology reduces energy requirements for rubber production and it does not require catalyst extraction as a result of high catalyst efficiency. Furthermore, the process enables the manufacture of new EPDM rubber grades. In addition, LANXESS will set up a new headquarters in Geleen for its global EPDM Rubber business. The building for up to 120 employees will be constructed on the chemical industrial site Chemelot. The contracts with the Chemelot Campus Consortium were signed today. Construction will start in the spring of 2012, and inauguration is planned for the beginning of 2013. LANXESS steers its global business with EPDM rubber from Geleen. In May 2011, LANXESS acquired the EPDM rubber business of Royal DSM N.V. for EUR 310 million, with 420 employees worldwide – including 260 in Sittard-Geleen. “The integration process of the new EPDM business into LANXESS is running smoothly and is already contributing very positively to group earnings,“ said Guenther Weymans, LANXESS Country Head for the Netherlands and Head of the Technical Rubber Products business unit. Last week, LANXESS announced that it plans to commercially produce EPDM from bio-based ethylene by the end of the year. It will be the first form of bio-based EPDM rubber in the world and will be sold under the brand name Keltan Eco. EPDM is conventionally produced using the petroleum-based raw materials ethylene and propylene. Alternatively, LANXESS plans to use ethylene derived purely from the renewable resource sugar cane. This bio-based form of ethylene is produced by dehydrating ethanol from Brazilian sugar cane. The company Braskem S.A. will supply the bio-based ethylene via pipeline to LANXESS’ existing EPDM plant in Triunfo, Brazil. Triunfo currently produces 40,000 metric tons per year of regular EPDM rubber and it is expected that the first batches of the product Keltan Eco will amount to several hundred metric tons. LANXESS is a leading specialty chemicals company with sales of EUR 7.1 billion in 2010 and currently around 15,800 employees in 30 countries. The company is at present represented at 46 production sites worldwide. The core business of LANXESS is the development, manufacturing and marketing of plastics, rubber, intermediates and specialty chemicals. LANXESS is a member of the leading sustainable indices Dow Jones Sustainability Index (DJSI) World and FTSE4Good. LANXESS is strengthening its commitment to Brazil with three major new investments totaling roughly EUR 30 million, or R$ 75 million, which will create more than 100 jobs. The investments will support the growing trend toward green mobility in the Latin American country. LANXESS’ high-tech materials will offer innovative solutions to the growing local automotive market. The three investments include the construction of two new plants at LANXESS’ Porto Feliz site in the State of São Paulo. One is for the production of the high-tech engineering plastics Durethan and Pocan – used primarily by the automotive industry to make cars lighter and more fuel efficient. The new plant, which will be run by the business unit Semi-Crystalline Products, will have an initial capacity of 20,000 metric tons per year. The plant will go on stream in the middle of 2013. The other new Porto Feliz plant will produce the rubber additives Rhenogran as well as Rhenoshape curing bladders. Rhenogran pre-dispersed rubber additives can significantly improve the quality and durability of a rubber product, while Rhenoshape bladders are used by the tire industry to give tires their final shape and properties. The plant will be run by LANXESS’ subsidiary, Rhein Chemie, based in Mannheim, Germany. It will have an output of 2,000 metric tons per year of rubber additives and produce 170,000 bladders per year. The plant will start in the fourth quarter of 2012. The third investment involves a pioneering move to use bio-based raw materials in the production of synthetic rubber. LANXESS is re-engineering parts of its plant in Triunfo, Rio Grande do Sul, in order to produce EPDM rubber from bio-based ethylene. The Brazilian company, Braskem S.A., will supply the ethylene, derived from sugarcane, by pipeline as of November 2011. This represents the world’s first production of bio-based EPDM rubber which will be named Keltan Eco. A quarter of the 40,000 metric tons annual capacity at the Triunfo plant is earmarked for Keltan Eco. “The use of bio-based raw materials to produce synthetic rubber at the Triunfo plant is in keeping with LANXESS’ ongoing commitment to green chemistry,” said Heitmann. LANXESS is the leader in high-performance synthetic rubbers for ‘Green Tires’ – the fastest growing sector in the tire industry, with an annual growth rate of about 10 percent. Demand is being driven by the megatrend mobility as well as motorists calling for higher environmental and safety standards. In addition, demand will be accelerated by tire legislation in the European Union, which aims to reduce CO2 and noise emissions by promoting ‘Green Tires’ that do not compromise on safety. Corresponding legislation has also been passed in South Korea. In order to meet this demand, LANXESS is expanding its global capacities for high-performance rubbers used in ‘Green Tires’, including those at its Brazilian sites. LANXESS has been implementing a capacity expansion at its production facility for neodymium polybutadiene rubber (Nd-PBR) in Cabo de Santo Agostinho, Pernambuco. It will complete the expansion by the end of 2011, doubling capacity to 40,000 metric tons per year. In addition, LANXESS has upgraded technology at the plant to the same levels used at its Nd-PBR plants in Germany and the USA. Nd-PBR is used in the treads and sidewalls of ‘Green Tires’. It helps reduce the energy consumption or rolling resistance of a tire. Nd-PBR also reduces abrasion thus playing a significant role in making tires more durable. At the same time, LANXESS has already initiated a feasibility study to implement new technology in order to switch production of emulsion styrene-butadiene rubber (ESBR) used in standard tires to solution styrene butadiene rubber (SSBR) used in ‘Green Tires’ at Triunfo. The current capacity for ESBR in Triunfo is 110,000 metric tons per year and the switch would potentially require a medium-size, double-digit million EUR amount. A final decision will be made mid-2012. SSBR is mainly used in the tread compound of 'Green Tires', where it helps to reduce rolling resistance and improve grip on wet roads. ‘Green Tires’ can reach their peak performance with formulations containing both SSBR and Nd-PBR. These latest investments are part of LANXESS’ growing presence in Brazil. The German company that purchased Petroflex in 2008 had started with more than 400 employees in Brazil seven years ago. Today it employs roughly 1,000 workers and is one of the largest chemical companies in Brazil. Brazil is also one of the most successful and fastest-growing markets for LANXESS products. The country accounted for less than one percent of LANXESS’ global sales in 2005. Today it accounts for roughly 10 percent of global, sales. Furthermore, Brazil sales reached a record EUR 701 million in 2010. Heitmann: “And we are well on track for another record year in 2011. In recognition of its commitment to green mobility in Brazil, on October 6, LANXESS will be hosting the first Brazil Automotive Day in São Paulo – an all-day conference featuring many of the leaders of the automotive and tire industries of Brazil and Latin America. 400 people will attend the event. LANXESS is strengthening its global asset base and product portfolio for premium, environmentally-friendly phthalate-free plasticizers. The specialty chemicals company has agreed to acquire UNITEX Chemical Corporation located in Greensboro, North Carolina. Financial details were not disclosed. The transaction also represents LANXESS’ first acquisition of a manufacturing site in the United States. Privately-owned UNITEX has about 40 employees based at its production site in Greensboro. The site has a capacity of more than 50,000 metric tons per year dedicated to mainly producing phthalate-free plasticizers and other specialty products, including flame retardants. UNITEX achieved sales of about USD 30 million in 2010. Through this acquisition, LANXESS will gain access to UNITEX’s flexible manufacturing facility coupled with an extensive portfolio of phthalate-free plasticizers, including benzoates, citrates and trimellitates. UNITEX’s product portfolio will strengthen LANXESS’ leading brands of phthalate-free plasticizers, including Mesamoll, Unimoll, Adimoll and Ultramoll. The size of the global phthalate-free plasticizers market is currently estimated at EUR 1.3 billion and is growing at seven percent per year. “This transaction underlines our technology leadership in specialty chemicals and strengthens our relationship with our customers in the USA – the world’s largest chemical market,” said Rainier van Roessel, Board Member of LANXESS. “I am delighted that UNITEX will be joining forces with LANXESS, whose focus on technology and strong global standing will give the Greensboro team the platform to achieve even more success,” said George W. Page, former President and owner of UNITEX. The transaction will close with immediate effect and LANXESS will finance the acquisition from existing liquidity. The UNITEX business will be integrated into the LANXESS business unit Functional Chemicals. Phthalate-free plasticizers have been growing in demand due to legislative initiatives in developed markets such as North America, Western Europe and Japan. This trend is now also being seen in emerging markets around the world such as Latin America. Regulators are calling for consumer products such as toys, food packaging and cables to contain the flexible plastic PVC, which has only been processed by phthalate-free plasticizers. LANXESS already enjoys a leading position in the phthalate-free plasticizer segment, driven by its current portfolio that includes the flagship product Mesamoll – a 100%-phthatlate-free platicizer based on alkyl sulfonic esters. In 2007, the U.S. Food and Drug Administration (FDA) approved the use of Mesamoll II in packaging for dry and aqueous-based food. In Europe, the European Food Safety Authority (EFSA) has also approved the use of Mesamoll in food contact applications. Functional Chemicals (FCC) belongs to LANXESS’ Performance Chemicals segment and is headed by Jorge Alberto Nogueira. Apart from specialty plasticizers, FCC manufactures phosphorous chemicals and colorants. It employs about 450 people mainly at its sites in Leverkusen and Krefeld-Uerdingen, Germany. LANXESS Corporation based in Pittsburgh, PA, currently employs about 900 people in the USA at nine locations and produces high-performance synthetic rubbers, advanced industrial intermediates and specialty chemicals. LANXESS Corporation achieved EUR 1.2 billion in sales in 2010. LANXESS is strengthening its commitment to renewable raw materials by investing USD 10 million in U.S. company BioAmber, Inc., based in Minneapolis, Minnesota, U.S., as part of a private placement. BioAmber is a global leader in succinic acid コハク酸 produced from renewable resources such as corn. Together, the two companies have developed plasticizers, whose cost-effectiveness and safety profile make them sustainable alternatives to phthalate-containing formulations. Market entry is expected later this year. In addition, both companies are in talks to extend their partnership into further product areas in the future. As part of the investment, LANXESS has received a minority shareholding in BioAmber and a seat on the Board of Directors, which will be filled by Jorge Nogueira, head of LANXESS' Functional Chemicals business unit that manufactures phthalate-free plasticizers. BioAmber was founded in October 2008 and has 40 full-time employees. BioAmber produces succinic acid through the fermentation of renewable raw materials. The process developed by BioAmber consumes considerably less energy than the production of succinic acid using fossil fuels, is significantly more cost-effective and has a better carbon footprint. In the future, the company plans to use waste from the agriculture industry and sugarcane processing as starting materials. “Our investment in BioAmber shows our commitment to launching a new generation of plasticizers that meet regulatory requirements and can also score in terms of sustainability,” said LANXESS’ Nogueira. “We are pleased to have LANXESS as a strategic investor alongside Naxos, Sofinnova, Mitsui & Co. Ltd. and Cliffton,” said Jean-Francois Huc, BioAmber’s CEO. “BioAmber is fortunate to have a strong, committed group of investors and we welcome Jorge Nogueira, a dynamic and experienced chemical industry executive, to our board”. As a global leader in the field of phthalate-free plasticizers, LANXESS has large production capacities, expertise in production and a global distribution network. Its key products include Mesamoll, Adimoll, Ultramoll, Unimoll and Uniplex. Through the acquisition of the UNITEX Chemical Corporation based in Greensboro, North Carolina, LANXESS also now has access to an additional capacity of 50,000 metric tons per year, plus an extensive portfolio of phthalate-free plasticizers such as benzoates, citrates and sulfonamides. BioAmber manufactures bio-based succinic acid in Pomacle, France, at a plant with 3,000 metric tons of capacity per year. BioAmber plans to add a further 17,000 metric tons of capacity from 2013 with a new world-scale manufacturing facility to be built in Sarnia, Ontario, Canada, at LANXESS' site there. Both companies are preparing agreements for LANXESS to provide BioAmber with the land as well as the utilities and services needed to operate the facility. The global market for phthalate-free plasticizers is currently estimated at EUR 1.3 billion – with annual growth rates of around seven percent. As a result of regulatory developments, demand for phthalate-free plasticizers is growing in markets such as North America, Western Europe and Japan. An increase in demand is also being observed in global growth markets such as Latin America. Authorities are increasingly restricting the use of phthalate-containing plasticizers for consumer goods such as toys, food packaging and cables. LANXESS is strongly committed to using renewable raw materials to produce premium synthetic rubbers. At the end of 2011, LANXESS produced the world’s first bio-based EPDM rubber in Brazil. The Brazilian company Braskem supplies the raw material ethylene derived from sugarcane. The rubber is marketed under the name Keltan Eco. In addition, LANXESS has invested in U.S. biofuel and biochemical manufacturer Gevo, Inc., which produces isobutanol from renewable resources such as corn. LANXESS plans to convert the isobutanol to isobutene, a key raw material for the manufacture of butyl rubber. BioAmber is a next generation chemicals company. Its proprietary technology platform combines industrial biotechnology, an innovative purification process and chemical catalysis to convert renewable feedstocks into chemicals for use in a wide variety of everyday products including plastics, food additives and personal care products. BioAmber produces bio-succinic acid in what it believes to be one of the world’s largest bio-based chemical manufacturing facilities. For more information visit the company’s web site at www.bio-amber.com. Specialty chemicals company LANXESS is strengthening its butyl rubber plant in Zwijndrecht, Belgium. The company has significantly invested to expand the production capacity of the existing plant and to build two new pilot plants for the development of production technology for butyl rubber. LANXESS is one of the world’s largest producers of butyl rubber, which is mainly used in the production of tires. The biggest share of butyl rubber produced in Zwijndrecht is premium halobutyl rubber. The Leverkusen-based specialty chemicals company operates three production plants in Belgium with around 1,500 employees through its two companies, LANXESS Rubber NV and LANXESS NV. At the Zwijndrecht site, LANXESS Rubber NV manufactures butyl rubber, primarily for the tire industry. “This investment underpins the major role that our butyl rubber production here in Zwijndrecht plays in our global strategy. Our plans for continued growth are founded on innovation and technology that serves the global megatrends – with the primary focus on solutions for sustainable mobility,” said Axel C. Heitmann, Chairman of the Board of Management at LANXESS, during the official opening ceremony. Butyl rubbers are used in tire inner liners - the innermost, air- and humidity-impermeable layer of a tubeless tire. They keep tire pressure constant over a long period, thus making vehicles safer and ensuring they consume less fuel and therefore produce fewer harmful emissions. Butyl rubbers can also be used in the tread of a tire allowing better grip and comfort. Special applications include protective clothing and medical devices. The use of butyl in chewing gum production represents one particularly interesting niche market. With the expansion, the capacity of the facility increased by 10 percent up to 150,000 metric tons of butyl rubber per year (from 135,000 tons). The expansion representing an investment of EUR 20 million was completed at the end of 2011, several months ahead of schedule. “In the coming decade, we expect demand to grow further so that the new capacities here in Zwijndrecht and from our upcoming plant in Singapore will be fully absorbed by the market,” said Ron Commander, Head of the business unit Butyl Rubber at LANXESS. In addition to the expansion in Zwijndrecht, LANXESS is building a new butyl rubber facility on Jurong Island, Singapore, with a total capacity of 100,000 metric tons per year. The plant, which will be the most modern of its kind and represents the company’s single-largest investment ever, is expected to start up in the first quarter of 2013. LANXESS has another butyl rubber plant in Sarnia, Canada, with a capacity of 150,000 metric tons per year. The new pilot plants at Zwijndrecht have been built in order to test an innovative production technology. The production process of butyl rubber is highly complex and requires process steps at temperatures, which range between minus 95 and up to plus 200 degrees Celsius. “As the technology leader in the global market for synthetic rubber we are constantly driving innovation. These pilot plants represent our large-scale implementation of the new process we are developing. The aim of the new technology is to use fewer resources and thus be more energy-efficient and environmentally friendly,” Heitmann explained. With its four world-scale plants and more than 1,400 employees, Belgium is the second largest country in terms of production within the LANXESS Group. Besides the butyl rubber plant, LANXESS produces caprolactam and glass fibers – intermediates for the high-tech plastics – and also rubber chemicals at its plants in the Antwerp docklands. German specialty chemicals company LANXESS has started up on schedule a nitrile butadiene rubber (NBR) plant in Nantong, China, as part of its 50:50 joint venture with Taiwan’s TSRC Corporation. The two companies have jointly invested USD 50 million (approx. EUR 39 million) in the new plant, which has an initial annual capacity of 30,000 metric tons. Some 100 new jobs have been created through the investment. China is the world’s biggest and fastest-growing NBR market, with a compound annual growth rate of approximately 10 percent. Demand is above all being driven by the automotive and construction industries. “The new plant is the most modern of its kind in Asia and will address the needs of the two leading megatrends in China – rapid urbanization and growing mobility,” said Axel C. Heitmann, Chairman of the Board of Management at LANXESS, during the official opening ceremony. The two partners set up a joint venture in May 2010 called LANXESS-TSRC (Nantong) Chemical Industrial Company Ltd. and supplied Chinese customers with NBR produced at LANXESS’ La Wantzenau site in France until the start-up of the Nantong plant. The new plant is built on an area of around 40,000 square meters and is located in the Nantong Economic and Technological Development Zone in Jiangsu province, northwest of Shanghai. Construction was achieved with a perfect safety record. LANXESS is the world’s largest producer of nitrile butadiene rubber, with a portfolio of more than 60 grades. The most important Krynac grades will be produced in Nantong. NBR products have a higher resistance to oil than conventional rubbers. They also demonstrate a better resistance to ozone, UV light, hot air and long-term aging. Greater China (Mainland China, Hong Kong, Taiwan and Macao) is a cornerstone of LANXESS’ global growth strategy and the company is targeting more than EUR one billion sales there in 2012. All of LANXESS’ 13 business units are represented at 10 sites in Greater China, with close to 1,000 employees in total. LANXESS is a leading specialty chemicals company with sales of EUR 8.8 billion in 2011 and currently around 16,700 employees in 30 countries. The company is at present represented at 48 production sites worldwide. The core business of LANXESS is the development, manufacturing and marketing of plastics, rubber, intermediates and specialty chemicals. LANXESS is a member of the leading sustainable indices Dow Jones Sustainability Index (DJSI) World and FTSE4Good. Specialty chemicals company LANXESS is investing EUR 75 million in the construction of a new plant for high-tech plastics in Antwerp. The world-scale facility for polyamide plastics is designed for an annual capacity of 90,000 metric tons and scheduled to begin operation in the first quarter of 2014. “This investment is yet another milestone on our way towards profitable growth, and a clear commitment to our Antwerp site. High-tech plastics play a critical role in our global strategy. Our plans for growth depend on innovations and technologies that support the global megatrends. Activities therefore are focused on solutions for sustainable mobility,” said Axel C. Heitmann, Chairman of the Board of Management of LANXESS AG, at the groundbreaking ceremony for the new polyamide facility. Global demand for high-tech plastics is expected to rise by five to six percent each year through 2020. The automotive industry is one of the main growth drivers for LANXESS plastics. The new plant for the polymerization of high-tech plastics is being built in the direct vicinity of the caprolactam facility operated by LANXESS in Antwerp. Caprolactam is the key precursor for plastics manufacturing at LANXESS. “With this new combination of facilities, we can supply our global network of compounding plants with polyamide plastics right from Antwerp in the future. That will make Antwerp the heart of our global business more than ever,” said Michael Zobel, head of the LANXESS High Performance Materials (HPM) business unit. All plastics manufactured at LANXESS in Antwerp will be processed within the LANXESS global network of compounding facilities into the final Durethan-brand products. The plastics are reinforced in some cases with glass fibers to further improve their properties and adapt them to customer needs. The glass fibers required for this purpose are likewise produced at a LANXESS facility in Antwerp. The automotive industry is a key customer of the HPM business unit. Highly innovative materials from LANXESS help to build much lighter plastic parts that can replace metal ones in motor vehicles and thus contribute to reducing fuel consumption and emissions. A lightweight design can reduce weight by ten to 50 percent, depending on the component. LANXESS plastics are used, for instance, in engine applications, door structures, pedals, front ends and cockpit crossmembers. Furthermore, the materials enable automobile manufacturers and suppliers to achieve considerable savings both in production and through simpler assembly. Another field of application for high-tech plastics from LANXESS is the electrical/electronics industry. LANXESS is greatly expanding its global production network for high-tech plastics. New plants are currently also under construction in Gastonia, U.S.A., and Porto Feliz, Brazil. The company previously opened a new production plant in Jhagadia, India, in January 2012, and recently doubled the capacity of its existing plant in Hamm-Uentrop, Germany. LANXESS completed the expansion of caprolactam production in Antwerp in 2011, increasing its former annual capacity of 200,000 metric tons by ten percent. Likewise LANXESS invests in its glass fiber facility in Antwerp’s harbor district. A first glass oven is being renewed completely this spring, the second one follows in the spring of 2013. The annual production capacity for glass fibers of 60,000 metric tons is being increased by ten percent. In the last 24 months, LANXESS has invested EUR 185 million in its global production network for high-tech plastics, EUR 125 million of that in its plants in Antwerp alone, including the new plastics facility. The High Performance Materials business unit is part of the Performance Polymers segment, which generated EUR 5.1 billion in total sales in fiscal year 2011. HPM has roughly 1,500 employees worldwide and operates production facilities in Belgium (Antwerp), Germany (Krefeld-Uerdingen and Hamm-Uentrop (JV)), China (Wuxi) and India (Jhagadia). LANXESS is building the world’s largest plant for EPDM synthetic rubber in China. The German specialty chemicals company is investing EUR 235 million in the plant in Changzhou 常州 (Jiangsu Province). This is the largest investment the company has made in China to date. The plant will have a capacity of 160,000 metric tons per year and the investment will create up to 200 new jobs. The plant is expected to start up 2015. All necessary permits have been obtained from the local authorities. LANXESS is the world's leading supplier of EPDM (ethylene propylene diene monomer) following the successful acquisition and integration of DSM Elastomers in 2011. It markets its products under the brand name Keltan. Global demand for EPDM is expected to increase by more than four percent per annum in the coming years, while demand in China is expected to grow by around eight percent, driven above all by automotive and construction industries. China will also continue to be the largest net importer of EPDM in the coming years. “We are strengthening our global EPDM asset base with a world-scale plant in China to serve our local customers even quicker with premium products,” said LANXESS CEO Axel C. Heitmann at today’s groundbreaking ceremony. “This plant also represents our company’s third major rubber investment in Asia and strengthens our credentials as the world’s leading provider of synthetic rubber,” added Heitmann. LANXESS will start up a world-scale butyl rubber plant on Singapore’s Jurong Island in the first quarter of 2013 and will break ground for a neighboring neodymium-based performance butadiene rubber plant on September 11 this year. The new EPDM plant will be located at the well-established Changzhou Yangtze Riverside Industrial Park, with access to excellent storage and ship uploading facilities. LANXESS will be supplied the key raw materials ethylene and propylene from a methanol-to-olefins (MTO) plant currently under construction at the site. The MTO process is a new way to produce these key raw materials, which are conventionally produced from refineries. During the construction phase, up to 2,000 people will be working on the site. LANXESS is already active at the Changzhou site, with the construction of a leather chemicals plant. The facility of up to 50,000 metric tons capacity per year represents an investment of EUR 30 million and is planned to go on stream by the first half of 2013. It will produce premium LANXESS leather chemicals for the local Chinese market used in various applications like leather tanning, dyeing and finishing. Some 100 jobs are being created. LANXESS already operates EPDM production sites in Geleen, the Netherlands, Marl, Germany, Orange, USA and Triunfo, Brazil, with a combined capacity of 320,000 metric tons per annum. LANXESS plans to convert 50 percent of its total production capacity at the Geleen site to Keltan ACE technology in 2013. EPDM is used above all in the automotive industry as door sealants or windscreen wipers. According to LANXESS estimates, approximately seven kilograms of EPDM is used in every car. The product is also used in the plastics modification, cable and wire, construction and oil additives industries. Its properties include very low density, good resistance to heat, oxidation, chemicals and weathering as well as good electrical insulation properties. Since the end of last year, LANXESS has been commercially producing EPDM from bio-based ethylene and marketing it under the brand Keltan Eco. LANXESS is using ethylene supplied by Braskem S.A. In comparison to petroleum-based ethylene, Braskem’s ethylene is produced by dehydrating ethanol from sugar cane. China is a cornerstone of LANXESS’ global growth strategy. The company is targeting sales of more than one billion EUR in Greater China (mainland China, Hong Kong, Taiwan and Macao) in 2012. All of LANXESS’ 13 business units are represented at 10 sites in Greater China, with roughly 1,000 employees in total. LANXESS will be holding its first-ever “Mobility Day” in Shanghai on September 6. Under the motto “Sustainable Technologies for China’s Future”, the company will be showcasing its latest products geared towards “Green Mobility”. Around 400 participants from industry, academia and associations will exchange ideas and discuss topics such as “Green Tires”, lightweight plastics, sustainable leather management, technical rubbers and battery technology. LANXESS achieved sales of some EUR 1.5 billion – around 17 percent of total sales – with products and technologies for "Green Mobility" in 2011. And the company expects this figure to rise by 80 percent to about EUR 2.7 billion in 2015. LANXESS is a leading specialty chemicals company with sales of EUR 8.8 billion in 2011 and currently around 16,900 employees in 31 countries. The company is currently represented at 48 production sites worldwide. The core business of LANXESS is the development, manufacturing and marketing of plastics, rubber, intermediates and specialty chemicals. LANXESS is a member of the leading sustainable indices Dow Jones Sustainability Index (DJSI) World and FTSE4Good. The Technical Rubber Products business unit (BU TRP) was split into two separate business units. Since January 1, 2013, Keltan Elastomers (core product ethylene-propylene-diene monomer - EPDM) started trading as an independent business unit under the same name of Keltan Elastomers (KEL). The rest of the TRP product portfolio (NBR, HNBR, EVM and CR) fell under the High Performance Elastomers (HPE) business unit. By acquiring DSM's Keltan business in May 2011, TRP had significantly expanded its EPDM business line to create by far the largest of all the business lines. LANXESS has also strengthened its position as a leading supplier of special-purpose rubbers. "The successful strategic development of EPDM to make us a global market leader and the specific features of all TRP business necessitate this split into two business units," says the former BU TRP head Guenther Weymans. Weymans took charge of BU KEL, which is headquartered in Geleen in the Netherlands. Some 600 staff based here and also in Marl (Germany), Orange (United States), Triunfo (Brazil) and Changzhou (China) will work for the BU with its elastomer products (EPDM). The main applications of EPDM are hoses, seals, belts and polymer additives. Jan Paul de Vries, who was in charge of the Advanced Materials business line EMEA of the High Performance Materials business unit (BU HPM), now heads up the new BU HPE, which will be headquartered in Cologne*. Some 900 staff based in Dormagen (Germany), Leverkusen (Germany), La Wantzenau (France), Orange (United States) and Nantong (China) will focus on rubber specialties and high-performance rubber. Unlike BU KEL, whose business focuses exclusively on a single product, EPDM, BU HPE's remit covers four different rubber grades and a far more diversified product portfolio. "The reorganization will enable us to meet the very specific demands this places on both business units far more effectively," explains Weymans. To make even better use of synergies in the future, around 100 existing TRP staff from the Technical Service Center in Dormagen and the Polymer Testing Center in Leverkusen - with its subunits in Qingdao (China) and Geleen (Netherlands) - switched to the Innovation & Technology group function (GF INN), also on January 1, 2013. German specialty chemicals company LANXESS is expanding its global production network for inorganic pigments in China. A new high-tech facility for premium iron oxide red pigments is being constructed at the Ningbo Chemical Park on the Chinese East Coast. The plant, with highly modern environmental standards, will initially have an annual capacity of 25,000 metric tons. The investment of about EUR 55 million will create 150 new jobs. Construction will begin in the second quarter 2013. The production startup is scheduled for the first quarter of 2015. The megatrend urbanization has created an increasing demand for high quality, sustainably produced pigments throughout the world. Ningbo, located in the coastal province of Zhejiang, is China's second largest cargo port. The location for the new plant is the Ningbo Petrochemical Economic & Technological Development Zone (NPEDZ). The new LANXESS site will initially cover roughly seven hectares. A further plot of similar size has been reserved for potential expansion. The highlights of the industrial area are the outstanding infrastructure and logistical links. The largest terminal for liquid chemicals in China is located there. LANXESS will manufacture high quality iron oxide red pigments at the new plant using an improved and highly sustainable Penniman process. “With our advanced and innovative production process, we are raising the bar for the production of iron oxide pigments worldwide especially in terms of water treatment, waste gas cleaning and energy consumption,” said Joerg Hellwig, Head of the Inorganic Pigments business unit. “In addition, the new plant will strengthen our global production network of existing plants in Germany, China and Brazil,” he added. The company will market their yellow shaded red pigments globally under the well-known brand Bayferrox. Key customers are manufacturers of paints and coatings. Furthermore the construction and plastics industries will be supplied. LANXESS already operates one of China’s largest and most modern plants for iron oxide pigments in Jinshan金山区, Shanghai. This plant has an annual capacity of 38,000 metric tons of high-quality iron oxide yellow and black pigments each year. With an annual capacity of more than 350,000 metric tons, the LANXESS Inorganic Pigments (IPG) business unit is one of the world's leading manufacturers of inorganic iron oxide and chromium oxide pigments. The heart of global production is located in Krefeld-Uerdingen, Germany. The business unit has close to 1,300 employees and is part of LANXESS’ Performance Chemicals segment. China plays a key role in LANXESS' global growth strategy. All 14 LANXESS business units are represented with a total of around 1,000 employees at the 10 sites in Greater China. It represents about 10 percent of LANXESS’ Group sales. LANXESS is a leading specialty chemicals company with sales of EUR 8.8 billion in 2011 and currently around 17,100 employees in 31 countries. The company is currently represented at 48 production sites worldwide. The core business of LANXESS is the development, manufacturing and marketing of plastics, rubber, intermediates and specialty chemicals. LANXESS is a member of the leading sustainable indices Dow Jones Sustainability Index (DJSI) World and FTSE4Good as well as the Carbon Disclosure Leadership Index (CDLI). LANXESS is strengthening its standing as the world’s leading producer of high-performance rubber. Following a feasibility study, the German specialty chemicals company has decided to convert production of emulsion styrene butadiene rubber (E-SBR) used in standard tires to solution styrene butadiene rubber (S-SBR) used in high-performance “Green Tires” at its site in Triunfo (Rio Grande do Sul) in southern Brazil. LANXESS is the first company to carry out such a conversion. The future capacity for S-SBR in in Triunfo will be 110,000 metric tons per year, exactly the same as the current E-SBR capacity. The switch in production technology represents an investment of EUR 80 million, which will be financed from the company’s cash-flow. Up to 500 temporary workers will be needed during the conversion phase. The plant will produce the latest grades of S-SBR at the end of 2014. A regular supply of E-SBR to customers will be maintained from the company’s plant in Duque de Caxias (Rio de Janeiro) in Brazil, which has enough production capacity to supply the entire Brazilian E-SBR demand. E-SBR is mainly used in the manufacturing and retreading of truck tires, which means tire carcasses can be reused several times, thus saving raw materials for tire production. LANXESS is the world’s largest producer of high-performance rubbers, including S-SBR and neodymium-based performance butadiene rubber (Nd-PBR) sold under the Buna brand name. Global growth for both rubber types is estimated at roughly 10 percent per year, up to 2017, as consumers shift to more fuel-efficient and environmentally-friendly “Green Tires”. Demand for “Green Tires” is being driven by the megatrend mobility, above all in the regions of Asia and Latin America, as the middle class there becomes more affluent. In addition, demand will accelerate as tire labeling continues to be introduced around the world. November 2012 saw the launch of mandatory tire labeling in the European Union (EU), similar to the consumer labels found on refrigerators and washing machines. Tires are graded from A (best) to G according to their fuel efficiency and from A to F according to their wet grip. Rolling noise is also measured. Therefore, the new legislation provides greater transparency for consumers by highlighting the added value of “Green Tires”. Japan and South Korea were the first countries in the world to introduce a labeling system. After a voluntary tire label was introduced in Japan in January 2010, South Korea launched its voluntary labeling program in November 2011 and introduced a mandatory label in December 2012. The Brazilian government aims to implement tire labeling, modeled on the EU standards, as of October 2016, while the topic in China is taking shape as part of the country’s current five-year-plan. Studies show that 20-30 percent of a vehicle’s fuel consumption and 24 percent of road vehicle’s CO2 emissions are related to tires. “Green Tires” can reduce fuel consumption by 5-7 percent and have a shorter cost amortization period in comparison to other fuel-saving technologies in cars such as automatic start-stop systems and hybrid drives. “This means consumers can save real money in times of rocketing gasoline prices,” said Breuers. “Green Tires” can reach their peak performance with formulations containing both S-SBR and Nd-PBR. S-SBR is mainly used in the tread compound of “Green Tires” and Nd-PBR is used in the treads and sidewalls. While both rubbers help to increase fuel efficiency of a tire by reducing rolling resistance, S-SBR helps improves grip on wet roads, while Nd-PBR is highly resistant to abrasion thus making tires more durable. Last year, LANXESS showcased an “AA-rated” concept tire that was developed by the company in Germany and tested by TÜV SÜD, one of the world's leading independent technical service organizations. The concept tire comprises the latest generation Nd-PBR and S-SBR technology, as well as rubber additives, to achieve a grade of “A” for both rolling resistance and wet grip under the new EU tire-labeling rules. It is one of the first tires in the world to achieve an AA-rating. In the past two years, LANXESS has increased its global capacities for the high-performance rubbers S-SBR and Nd-PBR by 70,000 metric tons per annum. The company has achieved this through debottlenecking measures at its plants in Dormagen, Germany, Orange, USA and Cabo de Santo Agostinho (Pernambuco), Brazil. In addition, the company produces S-SBR at is facility in Port Jérôme, France. In addition, the company broke ground for a new world-scale Nd-PBR plant in Singapore last September to serve, above all, the growing Asian tire industry. The plant, representing a total investment of EUR 200 million, will have a capacity of 140,000 metric tons per year and will start up in the first half of 2015. S-SBR and Nd-PBR belong to LANXESS’ Performance Butadiene Rubbers (PBR) business unit. Alongside tires, performance butadiene rubbers are used for the modification of plastics in the manufacture of High-Impact Polystyrene (HIPS) for injection molding applications. Other applications include golf balls, running shoes and conveyor belts. PBR is part of LANXESS’ Performance Polymers segment, which achieved total sales of EUR 4 billion in the first nine months of 2012. Brazil is one of the most successful and fastest-growing markets for LANXESS products and a cornerstone of the company’s BRICS strategy. The country accounted for less than one percent of LANXESS’ global sales in 2005 but now accounts for roughly 10 percent of global sales. Marcelo Lacerda is Country Representative for the company’s national activities. LANXESS became one of the largest chemical companies in Brazil following its acquisition of Petroflex in 2008 and now employs roughly 1,100 workers at its headquarters and seven locations. LANXESS and Genomatica announce that LANXESS has run a production campaign of bio-based PBT in LANXESS’ world-scale production plant using 20 metric tons of bio-based BDO made with Genomatica’s commercially-proven process. This BDO fully complied with the demanding LANXESS specifications for petro-based BDO allowing a direct feed of 100% bio-based BDO into the continuous production process. The properties and the quality of the resulting bio-based PBT are fully equivalent to conventional petro-based PBT with regard to all tested parameters. The world-scale PBT plant, with a capacity of 80,000 metric tons per year, is located in Hamm-Uentrop, Germany, and operated as a joint venture in which LANXESS has a share of 50%. Genomatica’s BDO process technology converts sugars – a renewable feedstock – into the major chemical BDO in a patented, ’direct’ fermentation process. Genomatica is a widely-recognized technology leader for the chemical industry. It delivers new manufacturing processes that enable its licensee partners to produce the world’s most widely-used chemicals a ‘better way’, from renewable feedstocks, with better economics and greater sustainability than petroleum-based processes. Genomatica’s first process, for BDO, is now commercial. Genomatica is also developing processes for other high-volume chemicals, including butadiene. Genomatica’s recognition includes the ‘Wall Street Journal Technology Innovation Award’, ‘ICIS Top 40 Power Players: Ones to watch’, the ‘EPA Presidential Green Chemistry Challenge Award’ and being voted two years in a row ‘No.1 in the Biofuels Digest’s 30 Hottest Companies in Renewable Chemicals and Biobased Materials’. More infiormation at www.genomatica.com. German specialty chemicals company LANXESS has just started piling for a premium iron oxide red pigments facility in Ningbo. LANXESS is investing EUR 55 million in the plant, which will have an initial capacity of 25,000 metric tons annually. With the start of the piling process, the construction work is proceeding right on schedule. New red iron oxide pigments will be introduced to the global market in the first quarter of 2015. Through its new plant, LANXESS will create 150 new, jobs in Ningbo. German specialty chemicals company LANXESS today celebrated the opening of its first production facility in Russia. In the new plant at the Lipetsk site, LANXESS subsidiary Rhein Chemie manufactures polymer-bound rubber additives for the markets in Russia and the Commonwealth of Independent States (CIS), primarily for the automotive and tire industries. A production facility for the bladders used in tire production is to be added in 2016. The overall investment volume in euros amounts to a seven-digit figure and 40 new jobs will be created at the new plant in the medium term. “This production site underlines our focus on the global growth markets. That applies both to the group as a whole and to Rhein Chemie, which now has its own plants in all the BRIC markets,” says Rainier van Roessel, member of the Board of Management of LANXESS AG. As recently as May this year, Rhein Chemie opened a plant for high-performance bladders in Brazil. “Opening our first production facility in Russia marks yet another milestone in our long-term commitment to this market. Since entering the market in 2009, we have quadrupled our sales in Russia and established strategic partnerships in our target industries and with research institutes. The new facility will enable us to harness market potential more effectively, particularly in the automotive and tire industries,” explains Werner Breuers, member of the Board of Management of LANXESS. Studies reveal that, in the medium term, annual percentage growth rates for the Russian automotive and tire industries are expected to be in the mid to high single digit range. Lipetsk offers outstanding conditions for the group. “Its excellent location in close proximity to our customers and the good infrastructure in the Lipetsk Industrial Park were crucial to our decision to choose the site,” says Anno Borkowsky, Managing Director of Rhein Chemie Rheinau GmbH. Every year, the company will produce up to 1,500 metric tons of predispersed, polymer-bound Rhenogran rubber additives at the plant in Lipetsk. Rhein Chemie is a leading supplier for these products, which are used primarily in the manufacture of car tires and technical elastomer products such as profiles, hoses and seals. They are easy to handle and enable faster processing in the rubber compound. Using Rhenogran also significantly increases the quality of rubber components and improves their long-term functionality and durability. A facility capable of producing up to 80,000 Rhenoshape bladders annually is to be added to the complex in 2016. Bladders are used in the tire industry to give tires their final form and properties. “We are seeing a rise in demand from the Russian automotive and tire industries for quality products and, thanks to our new plant and high-quality, innovative product portfolio, we can now cater to their needs directly from Russia,” comments Borkowsky. LANXESS has had its own company in Russia since 2009. During this time, business has developed strongly. In 2012, LANXESS achieved sales of approximately EUR 80 million on the Russian market, around four times as much as in 2009. LANXESS has been working closely with the Russian Academy of Sciences in the field of research and development since 2009 and has established a research network with leading Russian institutes and universities. In addition, the group contributed to the official Germany Year in Russia in 2012 with the “LANXESS Young Euro Classic Concert Russia” and a scientific symposium featuring high-profile speakers. LANXESS is countering the challenging business environment with a comprehensive efficiency program. Currently, it is foremost the synthetic rubber activities that are experiencing a temporary weakness in demand, increased competition in the market and volatile raw materials prices. As part of the “Advance” program, the company therefore plans to reduce costs and headcount, as well as optimize its portfolio. Heitmann confirmed the company’s full-year guidance for 2013 of EUR 700-800 million EBITDA pre exceptionals, excluding potential inventory devaluations. As part of the “Advance” program, LANXESS is aiming to achieve about EUR 100 million in annual savings from 2015 onward through efficiency improvements and targeted restructuring. This will lead to a headcount reduction of about 1,000 employees worldwide by the end of 2015. The positions will be phased out through a voluntary separation program, which includes early retirement packages and severance pay. In addition, the variable compensation for the current business year will be reduced for those who are eligible. This includes the Board of Management. All measures are being coordinated with employee representatives. Restructuring has already been implemented within the Rubber Chemicals business unit, which is closing a site in South Africa and downsizing its operations in Belgium. In addition, LANXESS will adjust its business operations globally to reflect the current market situation. The company will also continue with its proven flexible asset management strategy. In total, some EUR 150 million in one-off charges will be booked in 2013 and 2014 to cover the “Advance” program. LANXESS will maintain its current structure of 14 business units under its three established segments. At the same time, the company is pursuing strategic options for specific non-core businesses. These non-core activities have combined sales of roughly EUR 500 million, close to EUR 30 million in EBITDA pre exceptionals, and a headcount of roughly 1,000. High Performance Elastomers’ (HPE) nitrile butadiene rubber business line. The affected sites are in Brunsbuettel and Dormagen, Germany, Kallo, Belgium, Bushy Park, USA, Jhagadia, India, La Wantzenau, France, and Nantong, China. All options for these sites will be considered in line with legal frameworks and local employee participation. Perlon-Monofil GmbH is a subsidiary of Lanxess and manufactures a wide range of Polyamid and Polyester monofilament products for different applications sold on the world market under the brand names Perlon®, Atlas® and Bayco®. “Each of these businesses is well positioned in its market, but can develop better over time with a different partner,” said Heitmann. As part of its portfolio management activities over the mid- to long term, LANXESS is predominantly targeting acquisitions that will strengthen its Advanced Intermediates and Performance Chemicals segments and thus further diversify the Group’s structure. “Any potential additions to the company must present a clear strategic and cultural fit, as well as being accretive to key financial metrics,” said Heitmann. LANXESS will continue to give priority to organic growth. Capital expenditures have been reduced to roughly EUR 600 million this year, while at the same time key strategic projects are being implemented. In the future, the focus will be more on smaller projects and debottleneckings. LANXESS is currently pushing ahead with three important investment projects serving the megatrend mobility. They are a neodymium polybutadiene rubber (Nd-PBR) plant in Singapore, an ethylene propylene diene monomer (EPDM) rubber plant in China and a polyamide plant in Belgium. Construction is progressing according to plan. Germany's Lanxess is in talks with Russia's NKNK and state-owned Saudi Arabian Oil Company (Saudi Aramco) to sell a stake in its tyre rubber business, people familiar with the matter told Reuters on Monday, as it battles overcapacity and weak prices. Lanxess had previously said it was searching for a partner for a production or marketing alliance to tackle production overcapacity and weak prices in the synthetic rubber industry. In a statement on Monday, Lanxess said strategic options were being considered for the unit, particularly a joint venture, and that a deal may cover only parts of the rubber business. Lanxess declined to comment further. Asian rivals are challenging its dominant position in synthetic rubber with plans to bring more capacity on stream this year. NKNK, also known as Nizhnekamskneftekhim, is based in the in the Russian Republic of Tatarstan and it competes with Lanxess in so-called Nd-PBR rubber, used in fuel efficient tyres. Saudi Aramco has been seeking to make inroads into more advanced chemicals to diversify away from its oil and basic petrochemicals businesses. Shares in Lanxess, the world's biggest maker of synthetic rubber for car tyres, earlier rose to their highest in 4-1/2 months after a report by Bloomberg that the company was in talks with Saudi Aramco, among others, to sell a minority stake in its synthetic rubber unit. Bloomberg reported that two proposals had been submitted, with one party interested in a stake of about 40 percent. Saudi Aramco and NKNK were not immediately available for comment. Two people close to Lanxess told Reuters the firm had previously held talks with petrochemicals companies such as LyondellBasell and India's Reliance. Officials at the two groups were not immediately available for comment. Industry experts said the synthetic rubber business could have a price tag of about 6-7 times annual core earnings if a competitive bidding can be arranged. That would value all of the Performance Polymers division, which contains the bulk of Lanxess' synthetic rubber businesses, at roughly 2-2.4 billion euros ($2.3-$2.7 billion), based on Warburg Research estimates for the division's 2015 earnings. It remains unclear, however, whether Lanxess is looking to sell all or only some businesses within Performance Polymers and how big a stake the suitors are eyeing. Shares in Lanxess closed 2.2 percent higher at 45.62 euros, reaching their highest since late September and outperforming a 1.7 percent fall of Germany's blue-chip index. The company has also initiated the first measures from the second phase, which is aimed at improving operational competitiveness. In light of current market overcapacities for synthetic rubbers, LANXESS is optimizing its production networks for ethylene propylene diene monomer (EPDM) rubber and neodymium-based performance butadiene rubber (Nd-PBR). The company intends to stop EPDM rubber production at its Marl, Germany, site at the end of 2015. Within LANXESS’ EPDM production network, the Marl facility is the least competitive due to economy of scale limitations and comparatively high energy and raw material costs. The workforce in Marl currently totals around 120 people. LANXESS will be entering into negotiations with employee representatives without delay in order to find mutually acceptable solutions for these employees. During the course of 2016, LANXESS will be focusing Nd-PBR production at its sites in Dormagen, Germany, and Singapore. The Nd‑PBR facilities at the sites in Orange, United States, and Cabo de Santo Agostinho, Brazil, will then exclusively serve the respective region. The capacities thus freed up at the facilities in Port-Jérôme, France, and Orange, will be used in the future to manufacture other butadiene rubber grades. In addition, LANXESS reduces the capacity to use for butadiene rubbers in Orange as part of its flexible asset management, operating only three out of four production lines simultaneously. Following the reorganization, LANXESS would have one production facility each for EPDM and Nd-PBR rubber in North America, Latin America, Asia and Europe. The company anticipates a reduction of around 140 positions as well as exceptional charges of some EUR 55 million for the reorganization of its production networks for EPDM and Nd-PBR. From the end of 2016, it expects to achieve annual savings of around EUR 20 million. Specialty rubber manufacturer Lanxess will announce the company it is to partner with in the rubber business in early November, a spokesperson said. The partnership will mark the third and final phase of the company’s realignment program which started in November 2014 in a bid to improve performance. Saudi Aramco is reportedly among the leading potential partners for Lanxess, with other experts suggesting that Russian petrochemical group Sibur is also in the frame. “The third phase will focus on improving the competitiveness of the business portfolio, especially through cooperations in the rubber business. Lanxess is currently in talks with potential partners and will report on further steps in the second half of 2015,” the company announced in May. The second phase, launched earlier in March, aims at improving operational competitiveness. This included the closure of an EPDM plant in, Marl, Germany, and realignment of production networks for EPDM and neodymium-based performance butadiene rubber (Nd-PBR). Lanxess is currently in talks with both customers and employees about the closure of its EPDM plant in Marl, and will shift production elsewhere. The facility will close down on schedule at the end of 2016, concluding the realignment program. The firm said about 140 employees will be affected from the re-alignment of its rubber production footprint. In May, Lanxess said it anticipates exceptional charges of about $58.7 million associated with the reorganization of its EPDM and Nd-PBR production network along with annual savings of about $21.3 million from the end of 2016. The first phase of the program included reducing 1,000 positions of its work force, which Lanxess said now consists of about 16,700 people in 29 countries with 52 production sites. The firm also consolidated to 10 business units from 14 and to 12 group functions from 16. The first phase will achieve about $160 million in annual savings by the end of 2016. The specialty chemicals company LANXESS and Saudi Aramco plan to establish a joint venture for synthetic rubber detailed in an agreement signed today. LANXESS and Saudi Aramco subsidiary, Aramco Overseas Company, will each hold a 50 percent interest in the joint venture, with annual sales of approximately three billion Euro in 2014. Saudi Aramco is to pay approx. EUR 1.2 billion in cash for its 50 percent share after deducting debt and other financial liabilities. The total joint venture is valued at EUR 2.75 billion. The transaction still requires the approval of the relevant antitrust authorities and is expected to be completed in the first half of 2016. LANXESS will contribute its synthetic rubber business to the new joint venture. This will include the Tire & Specialty Rubbers (TSR) and the High Performance Elastomers (HPE) business units, their 20 production facilities in nine countries and some 3,700 employees and additional support staff. The high-performance rubbers manufactured by LANXESS are mainly used in the production of tires and technical applications such as hoses, belts and seals. The main customers include the automotive and tire industries but the products are also used in the construction industry and by oil and gas companies. Saudi Aramco will provide the joint venture with competitive and reliable access to strategic raw materials over the medium term. The new joint venture will be managed by a holding company headquartered in the Netherlands. The CEO will be appointed by LANXESS and the CFO will be appointed by Aramco Overseas Company. Each company will have equal representation on the JV’s board of directors. LANXESS will consolidate the JV’s financials. LANXESS plans to use around EUR 400 million of the proceeds from the transaction to invest in the growth of the well-positioned and less cyclical segments Advanced Intermediates and Performance Chemicals. Another roughly EUR 400 million is earmarked for a further reduction of its financial debt position and around EUR 200 million are planned to be used for a share buyback program. Lanxess AG and Saudi Arabian Oil Co. said they will form a 2.75 billion-euro ($3.1 billion) venture to draw on the Middle East company’s access to raw materials and make a struggling synthetic-rubber division more competitive. Each party will hold 50 percent in the business, the two companies said in statements Tuesday. Saudi Aramco will pay about 1.2 billion euros in cash for the stake, adjusted for debt and payables. Bloomberg earlier reported the planned transaction. The oil-and-gas major outbid suitors including Ineos Group AG, according to people familiar with the situation. Berenberg in a July report said that Aramco would be among the “very well-fitting potential partners.” On its own, Lanxess suffered from higher costs for raw-materials such as benzene and styrene at a time when the market for its synthetic rubbers is in a phase of oversupply. Lanxess Chief Executive Officer Matthias Zachert, who returned to the company to take the helm in April 2014 after a previous stint as finance chief, is transforming the business. As well as seeking a partner for the rubber business to reduce exposure to that industry, he has also cut jobs and streamlined production. Lanxess will contribute its tire and specialty rubber operations and an elastomers unit. The sale will provide Zachert with the financial flexibility to expand other areas of the business less tied to the automotive industry, such as chemicals to treat water supplies. For Saudi Aramco, the deal marks a move from oil, gas and petrochemicals to a downstream industry that synthesizes these inputs for clients making tires and automotive parts. It will heighten a rivalry with Saudi Basic Industries Corp., which expanded into plastics with the purchase of General Electric Co.’s polymers division for about $11.6 billion in 2007. Under the leadership of its new chief executive, Amin al-Nasser, Saudi Aramco is looking to become one of the world’s largest integrated energy companies by the end of this decade. It’s building a $20 billion chemical plant in Jubail with Dow Chemical Co. that will be fully operational next year, and creating special zones to manufacture end products using its chemicals around its new refineries in Jubail, Rabigh and Jazan. It’s building another one around Sadara, its chemical venture with Dow in Jubail, and earlier this year obtained $10 billion in loans to finance mergers and acquisitions. “Value added, technology transfer, job creation and the possibility of opening up Saudi Arabia’s petrochemical industries to international players makes economic sense for the country and sets the stage for further downstream related acquisitions in the future," said Mohamed Ramady, an independent energy analyst and former Professor of Finance and Economics at King Fahd University of Petroleum and Minerals at the city of Dhahran, where Saudi Aramco is based. “The Aramco move comes on the heel of SABIC and Exxon Mobil’s plans to expand their Saudi based petrochemical joint venture Kemya, pointing towards a possible future strategic linkage between Aramco and SABIC in the domestic and international petrochemical sector to achieve economies of scale, expertise, marketing and financing," Ramady said by email. German specialty chemicals company Lanxess entered into an agreement with Chongqing Changshou Chemical 重慶長寿化工 to establish a 50:50 Joint Venture (JV), which will act as the exclusive agent of polychloroprene rubber and adhesive products for both companies. The transaction is pending for approval and is expected to be completed in the first half of 2016. "Combining the strengths of Chongqing Changshou Chemical's sales channel and fairly complete product range with Lanxess' expertise in product quality and brand value will surely result in a win win cooperation and enhance the competitiveness of both companies' products," said Jan Paul de Vries, Head of Lanxess' High Performance Elastomers business unit. At present, the JV will concentrate on marketing and sales of polychloroprene rubber and (solid) adhesive grades of both companies. Lanxess produces polychloroprene rubber at its Dormagen site in Germany. It is marketed under the name Baypren. Applications of Baypren high performance rubber include the automotive sector, where they are used to make windshield wipers, hoses, belts, seals, insulating foams and air springs, Lanxess stated. "China is the world’s largest chloroprene rubber market. With the advancement of urbanization, the growth of the automotive industry and the continuous expansion of China’s railway transportation network, local demands for polychloroprene are expected to keep growing in the long run," said Chien Ming Cheng, CEO of Lanxess Greater China. "The alliance will add to our advantages and facilitate our growth in the local market." Arlanxeo Holding B.V. officially opened its new headquarters in Maastricht on June 22. The firm launched in April as a 50/50 joint venture between Lanxess A.G. and Saudi Aramco for synthetic rubber. Arlanxeo said it will control all of the firm’s global operations from Maastricht. LANXESS reaches the next milestone on its growth path: The specialty chemicals company announced plans to acquire US-based Chemtura Corporation, one of the major global providers of high-quality flame retardant and lubricant additives. With the largest acquisition in its history, LANXESS is building on its own additives portfolio and will become one of the world’s major actors in this growing market. The companies have signed a definitive acquisition agreement. Under the terms of the agreement, Chemtura shareholders will receive USD 33.50 per share in cash for each outstanding share of common stock held, which represents a 18.9% premium to the stock’s closing share price of USD 28.18 on September 23, 2016. The transaction with an enterprise value of approximately EUR 2.4 billion will be financed by LANXESS mainly through senior and hybrid bonds, as well as from existing liquidity. The transaction, which is expected to close around mid-2017, is subject to approval by Chemtura shareholders, required regulatory approvals and certain other customary closing conditions. Headquartered in Philadelphia, Pennsylvania, Chemtura has 20 sites in 11 countries and approximately 2,500 employees worldwide. The company reported sales of around EUR 1.5 billion in the last four quarters with EBITDA pre exceptionals of approximately EUR 245 million (EBITDA margin of approx. 16%). Approximately 45% of Chemtura’s revenue is generated in North America. In addition to additives, Chemtura’s portfolio includes urethanes and organometallics. “The transaction provides premium value to our shareholders and benefits our customers and employees by making Chemtura part of a much larger, stronger global enterprise with the resources to fully support a more diverse suite of specialty chemicals products and services,” said Craig A. Rogerson, President, Chief Executive Officer and Chairman of the Board of Chemtura. For LANXESS, the acquisition of Chemtura will be accretive to earnings per share (EPS) in the first fiscal year, with annual synergies of approximately EUR 100 million expected by 2020. LANXESS is paying an EV/EBITDA multiple of approximately 7x including synergies for this transaction, meeting its target of 7-9x for acquisitions including synergies. Chemtura’s two additive segments form the main pillars of the company’s business. Both will, together with LANXESS’ Rhein Chemie Additives business unit (ADD), form the new Performance Additives segment after the closing of the transaction. ADD already offers a wide range of specialty additives and service products for the plastics, rubber, lubricants and colorants production, and employs around 1,600 employees worldwide at more than 20 locations. “Additives is a very attractive business field in specialty chemicals. In addition to their relatively low capital intensity, they require strong expertise and enable customized solutions. In this area, both Chemtura and LANXESS have long-standing expertise,“ said Anno Borkowsky, head of the LANXESS business unit Rhein Chemie Additives. The first pillar of Chemtura’s additives business includes lubricant additives and synthetic lubricants for industrial applications, such as in power generation and aviation. “Chemtura holds a competitive position in industrial lubricant additives. Moreover, Chemtura manufactures the necessary precursors and intermediates. Combined with our own additives portfolio, we will be a major supplier for industrial lubricants and will further strengthen our competitiveness through our integrated value chain,” explained Borkowsky. LANXESS expects the industrial lubricant additives market to grow at an annual rate of three to four percent in the medium term, primarily driven by steadily increasing requirements with respect to the performance and environmental sustainability of lubricants. The second pillar is mainly comprised of the brominated flame retardant additives, elemental bromine and further bromine derivatives businesses. Brominated flame retardant additives are used because of their high effectiveness, especially in the construction industry for insulation and in the electronics industry. Chemtura is a major supplier of bromine and brominated products and is well positioned due to its backward integration. “Flame retardant requirements continue to rise mainly due to the trend for energy-efficient construction,” said Borkowsky, adding: “With this acquisition, we will become a major global supplier of high performance flame retardant additives. In the future, we can offer our customers brominated and phosphorous-based products from one source.” Rhein Chemie Additives already has a competitive position in the phosphorous-based flame retardants business and features a backward integrated value chain. LANXESS also expects medium-term growth rates of three to four percent per year in the field of flame-retardant additives. Chemtura’s urethane business is a major provider for hot-cast prepolymers and for special, aqueous urethane dispersions and polyester polyols. These are components for special polyurethanes, which are used mainly in the construction, mining, oil/gas, sports and electronics industries. For example, rollers for conveyor belts and roller skates are manufactured from these polyurethanes. The urethanes business will be integrated into LANXESS’ High Performance Materials segment, in which the high-tech plastics business is anchored. Chemtura is counted among the major companies worldwide in organometallics. Organometallics are chemical compounds that are used, among other things, as catalysts in polymer production and for synthesis of fine chemicals and pharmaceuticals. This business will in the future be part of LANXESS’ Advanced Industrial Intermediates business unit. Specialty chemicals company LANXESS has successfully completed the purchase of the phosphorus chemicals business from Belgian chemicals group Solvay including its U.S. production site in Charleston, South Carolina. All relevant antitrust authorities have cleared the transaction. LANXESS and Solvay agreed to the purchase in mid-November 2017. The site in Charleston includes six production plants, where roughly 90 employees manufacture phosphorus chloride plus numerous derivative products such as flame-retardant additives and intermediate products for agrochemicals. The business represents annual sales of roughly EUR 65 million. The acquisition is another consistent step in the Group’s growth strategy with a focus on mid-sized markets and the North America and Asia regions. Solvay has agreed to sell its U.S. facility in Charleston, South Carolina, and the phosphorus derivatives-based products made at the plant to German specialty chemicals company Lanxess. Employees at the site will also be transferred. The products at the site are used primarily as intermediates in plastic additives, flame retardants and agricultural applications. The business represents sales of approximately €65 million. Completion of the transaction is subject to customary closing conditions, including antitrust approvals, and is expected in the first half of 2018.